You may laugh because it seems silly. You may groan because it seems so uptight. But using a simple kitchen timer has had a profound effect on my ability to be productive. There are lots of creative ways to use this little device, and I’ve surprised myself at how beneficial it’s been for me. If you want to go the computer route, there are free online timers or free timer apps. With mobile phones and tablets, there are probably more timer apps than you can shake a stick at. I personally prefer an actual physical device (a good, old-fashioned, “real” timer) – but that’s just me. I like to be able to use it anywhere, I like to be able to place the timer unobtrusively in my peripheral vision, and I like to be able to use my computer or phone and have the timer be totally separate. It’s a Polder Traffic Light Kitchen Timer. The cool thing about this particular model is that it will light up green when you have one minute left, orange when you have 30 seconds, and red when you have 10 seconds. This helps me to spend that last minute winding down. It can count down from any time (plug in 20 minutes and work until the alarm goes off) or it can count up (hit start and see how long a task takes me). 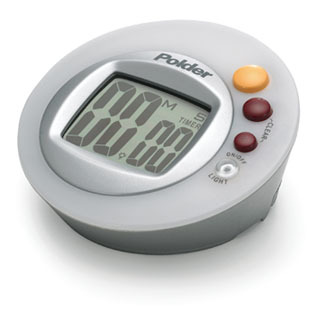 One important thing to consider is where you will place your timer in your workspace. I’m a big fan of placing your timer in your peripheral vision. Many timers have magnets so you can plunk them onto metal filing cabinets (which is what I’ve done). But enough about picking a timer – how do you benefit from using one? Writing a thesis, organizing a filthy garage, or designing a website can seem like impossibly large tasks. But by using a timer to break these monsters down into smaller chunks, the activity becomes manageable. When you sit down to write, your goal isn’t writing a thesis. You just want to write for 30 minutes (or 20 minutes or 50 minutes or 5 minutes – whatever time you set). When the timer goes off – congratulations on finishing a step towards your larger goal. Reward yourself if you want! Interruptions and distractions are always popping up. Not only that, but it takes a lot of discipline to work for a period of time without zoning out mentally. Using a timer helps you to block off a specific period of time that you’re only going to focus on one task. You can stall answering those Emails for 25 minutes. If you feel like taking a break, remind yourself that you can absolutely do that – after you focus on your work for the next 15 minutes. Focus, focus, focus until the timer goes off. Put your timer right in your peripheral vision. We don’t want it to be a distraction but an ever-present reminder that time is flying by. Seeing those seconds tick, tick, tick away is a humbling, convicting, and inspiring feeling. So you completed a good block of focused work – great! Don’t go and squander that victory by taking a 5 minute break that turns into a three hour break. Set the timer for 5 minutes. When the time’s up – back to work! The same can be true for other areas of distraction. Email or phone calls are hardly what you do “on your break” but these necessary tasks can quickly flood over their intended boundaries and eat away at the time that could better be spent on more important activities. Set a timer to limit these activities as much as you can. There are some things I hate to do. Absolutely hate to do. Like cleaning and organizing my office. Ugh. So I set the timer for 15 minutes and see if I can get everything done in that amount of time. If I can, I reward myself. If not, at least I’m done cleaning my office. Ugh. All this talk about timers may sound really crazy – but give it a shot! How do you guys use timers?